Create an effective transition game to lend itself to your team's strengths and identity! In this on-court presentation, Holtmann demonstrates his approach to offensive basketball. Starting with an offensive philosophy based on analytics, he uses it to explain the "why" of his team's offense - one that has continued the success of the basketball program at Butler University. In discussing his team's offensive philosophy, Coach Holtmann starts by introducing his four factors of offense. These four statistical measures are used to determine the team's offensive approach and to help his team improve. Coach Holtmann discusses questions that have to be asked of any basketball coach to analyze the effectiveness of their team's offense. He looks to determine the hardest actions for his team to guard. By determining what his team has difficulty guarding, those aspects get incorporated into his team's offense. Starting with a series of drills to build options in transition offense, Coach Holtmann incorporates transition offense as part of his offensive philosophy. Using a 5-on-0 drill that can be used as warm-up in practice, Coach Holtmann goes over the philosophy and roles in transition, with various options to spring the ball-handler with a properly angled and positioned single or double drag screen, in order to force rotations and long closeouts. Looking to get scoring opportunities early in the clock, Coach Holtmann teaches his players to run on turnovers, long rebounds, and blocked shots by getting the ball to a "bust-out guy." When the "bust-out guy" gets up the floor, he looks to either make an advance pass or use a transition drag screen set by the trailer. The transition drag screen allows the offense to spread out the defense and get an easy scoring opportunity. The transition offense presented is also designed to take advantage of good shooters who run the wings. Using the concept of "cut the court," your best shooter can get open for a transition three with the point guard using dribble penetration and a pitch-back. In building his team's half-court offense, Holtmann starts with basic spacing and penetration. He shows a 5-on-0 drill, which can be run from a 3-out or 4-out alignment, that emphasizes movement to space and drifting to make penetration into the lane more effective. You'll also see a 3-on-3 drill in the half court to practice the timing and spacing needed to pass and catch under pressure. Using 5-on-5 drilling, Holtmann works on transition offense with full-court action against a live defense. 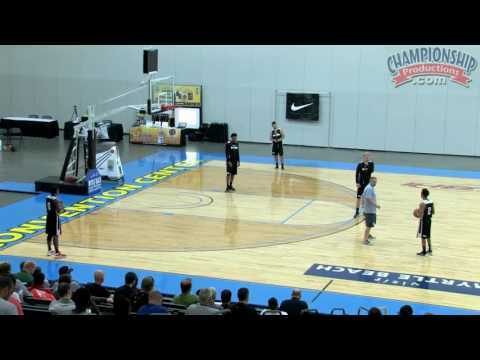 Using a 12-second shot clock to get quick scoring opportunities, this drill builds the attitude of getting players to play fast and attack a defense quickly. When the transition options do not produce an immediate scoring opportunity, the offense will then go into the half-court offense called Flow. Utilizing many of the concepts presented with basic spacing and penetration earlier, ball screens are added to take advantage of the defense and to get the ball to change sides of the floor as much as possible. Coach Holtmann does an outstanding job of not only describing the 'what' in his offense, but also the 'why' in explaining what they do. This video is a must for any coach who wants to build an offense and teach it to their team. Produced at the Spring 2016 Myrtle Beach (SC) clinic.